Here's the biggest news of the week—Microsoft has reportedly acquired GitHub for $7.5 billion. For those unaware, GitHub is a popular code repository hosting service that allows developers to host their projects, documentation, and code in the cloud using the popular Git source management system, invented in 2005 by Linux founder Linus Torvalds. GitHub is used by many developers and big tech companies including Apple, Amazon, Google, Facebook, and IBM to store their corporate code and privately collaborate on software, but Microsoft is one of the top contributors to the web-hosting service. Citing sources familiar with the matter, Bloomberg reports that GitHub opted to sell to Microsoft in part because it was impressed with the performance and leadership of Microsoft's CEO Satya Nadella, who has pushed the company to embrace open source technology. 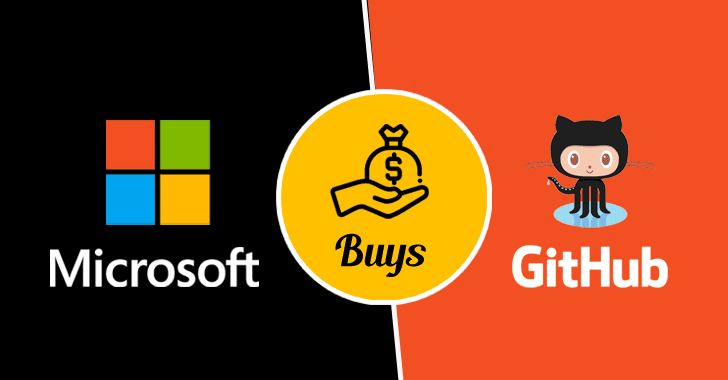 In a blog post published today, Microsoft has confirmed that will acquire GitHub for $7.5 billion in Microsoft stock, and the deal is expected to close by the end of 2018. "GitHub will retain its developer-first ethos and will operate independently to provide an open platform for all developers in all industries. Developers will continue to be able to use the programming languages, tools and operating systems of their choice for their projects — and will still be able to deploy their code to any operating system, any cloud and any device." "Microsoft Corporate Vice President Nat Friedman, founder of Xamarin and an open source veteran, will assume the role of GitHub CEO. GitHub's current CEO, Chris Wanstrath, will become a Microsoft technical fellow, reporting to Executive Vice President Scott Guthrie, to work on strategic software initiatives." GitHub was last valued at $2 billion in 2015. However, the decision has brought fear among some developers at open source community, with some Twitter users proclaiming the death of GitHub and open source software, and many considering to switch to rival services such as BitBucket or GitLab. The concern is completely rational and understandable. Despite the company's lack of a CEO and money woes, Github holds a privileged position in the software development ecosystem and plays a critical role. GitHub is, no doubt, a hub of the open source world, with 80 million code repositories hosted on the site as of March 2018. Microsoft, on the other hand, has once opposed to such open-source software development, with its ex-CEO Steve Ballmer describing Linux as "cancer." However, Nadella moved the company away from complete dependence on its Windows OS to more in-house development on Linux. Microsoft even brought Linux to Windows, via the Windows Subsystem for Linux. Microsoft's largest acquisition to date was LinkedIn, the job-oriented professional social network it acquired in 2015 for $26 billion, and many people are now concerned that the massive investment in LinkedIn will start to pay off for Microsoft. With both LinkedIn and GitHub, Microsoft is in a position to expand and strengthen LinkedIn. Also, the acquisition will give Microsoft access to a wealth of data and millions of software developers. What do you think of the GitHub acquisition deal? Will you continue using it? Let us know in the comments below.